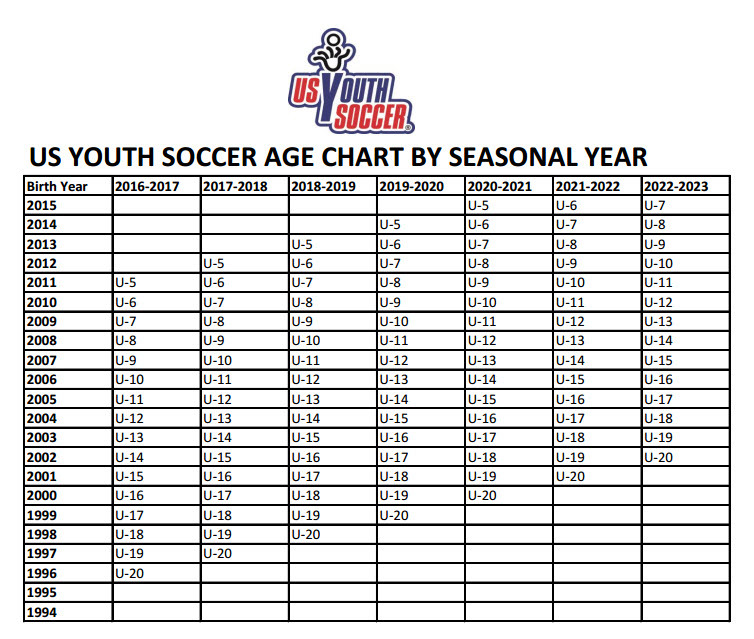 FSL uses the US Youth Soccer Birth Year Matrix to register our players. Recreational soccer begins at U6 (2016) through U15 (2003). Seasonal Year is from August 1st, 2017-July 31st, 2018. Players registered at U8 this fall, will continue to play U8 in the Spring. “U followed by age” really means that age & younger. We also have Fairhope Tots U4 & Fairhope Fives U5 programs. Where do I register my player if they participated in Fairhope Fives, however still 4 year old but born in 2012? We understand this tends to be confusing. If your players participated in our Fairhope Fives Program during the 2016/2017, your player will move to our traditional recreational soccer program with a volunteer parent coach. We do hope those who helped out with Coach Jamie, will move up with their player and coach at our U6 level. If this is my player's first year to play soccer but did not participate in Fairhope Fives last season, will he/she be behind? No, not at all. Half of our 2012 or U6 players have never played soccer before or participated in Fairhope Fives. Our main focus is FUN, while learning the basics of soccer. Open to all 2011 and 2010 players registering with FSL. It is a first come, first serve program. Yes. ALL Players MUST register within Got Soccer. Make sure to provide email, phone contact & emergency contact information. No. All children will be placed on a team. However, we do require player evaluations for all players in order to make all teams as fair and equal as possible. Each player will receive a jersey, shorts & socks for Fall. Player MUST provide soccer cleats, shin guards and a correctly sized ball. For safety reasons, players without shin guards or appropriate footwear will not be allowed to play. Please note that baseball, softball or football cleats may not be allowed, especially if they have a cleat in the front. Correct soccer cleats can be bought cheap, please get them. Make sure each player has hydration. If I volunteer to coach, will there be a mandatory background check? Yes. For the safety of our players and for purposes of our insurance, all volunteer coaches and other staff who will be on the field with the players must complete a mandatory online background check with GotSoccer/Alabama Soccer Association per year. If you have not completed a background check before, no practices or other interaction with players may occur before this background check is completed. This is a simple process and is free. You will register online under FSL Volunteer Coach Link. Saturday, September 23, 2017. Pictures will be taken Opening Day. Teams will be formed during the week following close of registration. Team Coaches will contact their teams by September 6th. Practices will begin after your coach has contacted you. Please remember that your coach is a volunteer and he/she works around their schedule. If you do not hear from your coach by Sunday, September 10th, 2017, please contact us. Will the league offer skills/pick up sessions for players? Yes, We will offer skills night/pick up this Fall—TBA. Skills encourage individual player development to improve ball control/mastery/skills. Pick Up is game of soccer where anyone can join, no skill requirements & it’s just for fun. There is no sense of obligation or commitment to play. Pick-up games lack officials, which makes the games more disorganized and less structured than regular games. We have a coach at the field for supervision only. Pick-up will begin immediately after Skills. Skills/Pick-up is optional but are offered as an additional benefit for players. Our Director of Coaching as well as Fairhope Academy Coaching Staff provides skills nights during the start of the season. When & Where are the games played? All teams will play on Opening Day. Regular games will be held on Tuesday, Thursday & Saturdays at Fairhope Soccer Complex (County Rd. 13 & Manley Rd.) All Tots/Fives practice & play games on Saturday mornings this Fall. Some age groups may play at Trione Park in Daphne against Daphne Strike Recreational/Development teams. Once teams are formed a detailed season schedule will be provided to coaches and posted on the website. My child is really good and/or physically big. Can he/she play with an older age group? Or my child is not very good and/or is physically small. Can he/she play with a younger age group? Generally, recreational players should play in their true age group. In exceptional circumstances, however, a player may be approved to play up if approved to do so by the FSL Committee. If there is any question as to whether the player should be approved to play up, an evaluation of the player under the supervision of our Fairhope Soccer Club coaching staff may be required. For a request to play up to be considered, the request must be made by e-mail to the FSL Chairperson prior to the close of registration. Otherwise, the player that has the ability and wants a higher level of training, you should consider either Fairhope Footies for additional training with in FSL, Fairhope Academy(U9-U12) or Gulf Coast Rangers FC (U13-U18). Players may not play down an age group. WE prefer pets stay home during the season, however if you need to bring them to Founder’s, please keep on leash & clean up after your pet. No PETS are allowed on playing fields. Who do I contact with any other questions?